Compare the best rates from 13 car insurance companies in Alabama. Our team has compiled data from all over Alabama, done the analysis and presented it below to help you find the perfect car insurance for your needs. We’ve made shopping for cheap car insurance in Alabama fun and easy, so you can quickly make an expert decision and get back to the things you enjoy in life. The average annual car insurance premium in Alabama is $1,358, slightly lower than the national average of $1,427. 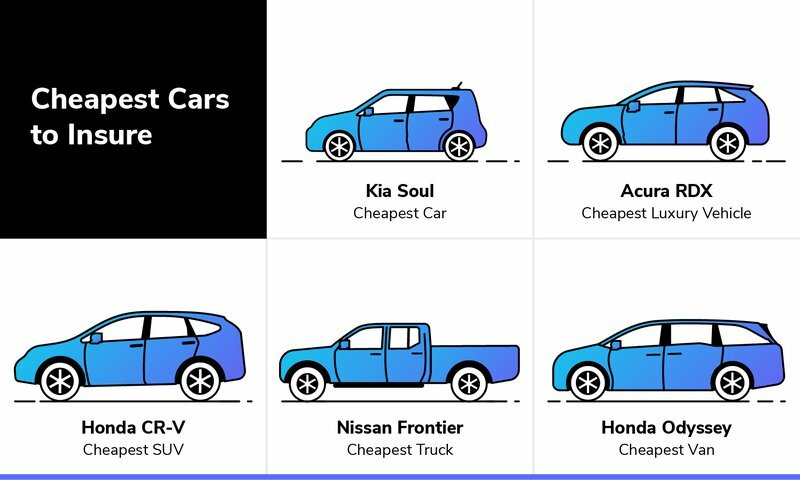 We’ve done the research to help you find the cheapest rates — read on for details! The cheapest car insurance in Alabama is Travelers, at $799 per year — or about $67 per month. Travelers' user satisfaction rating is A++, the highest rating an insurance company can receive. Travelers also offers discounts for driving a hybrid or electric vehicle, and for maintaining a clean driving record. Second is Cincinnati Insurance at $820 annually — or just over $68 per month. Cincinnati Insurance has a Superior financial strength rating, but its J.D. Power rating — how well the insurer handles claims — is Not Rated. The company's Not Rated standing is worth noting, but it does hold a user satisfaction rating of A+. USAA rounds out the top three at $913 annually ($76 monthly). USAA might be slightly more expensive than the top two, but it offers major benefits. USAA’s financial strength rating is Superior, meaning the company can keep your assets safe. Like Travelers, USAA's user satisfaction rating is A++. USAA has the highest J.D. Power rating of the top three, with a score of 5 out of 5. A high J.D. Power rating means the insurance carrier’s customers rated their overall insurance claims experiences well. For a more in-depth analysis of Alabama insurance company ratings, reference J.D. Power’s claims satisfaction study. Here’s the bottom line: if you live in or near the most populated cities in Alabama, you’re going to pay more for car insurance than you would in other areas of Alabama. Drivers in Opp can rest assured their car insurance rates are among the lowest in Alabama. At $1,200 a year, Opp's average rates are $150 less than the state average and more than $350 less than the average rates faced by drivers in Fairfield. 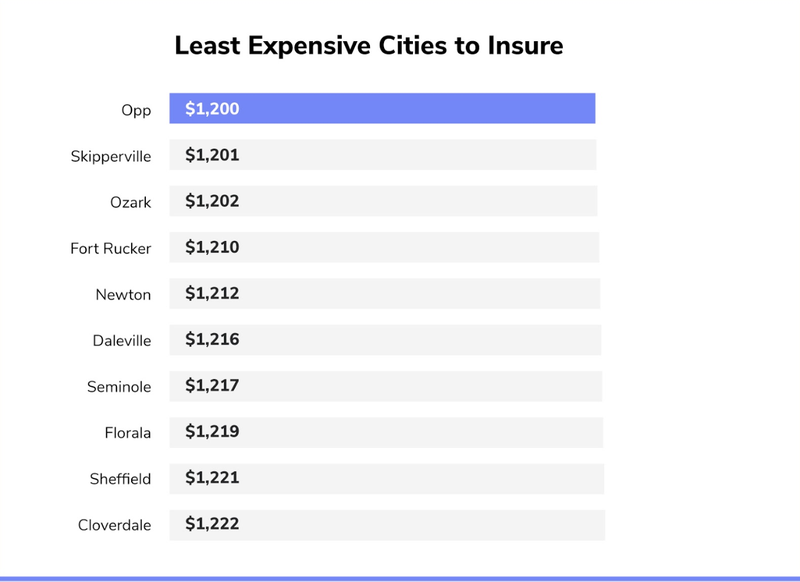 Drivers in each of the 10 cheapest Alabama car insurance cities pay less than $1,222 a year for insurance. View the graph above to see which Alabamans pay the least in car insurance premiums each year. 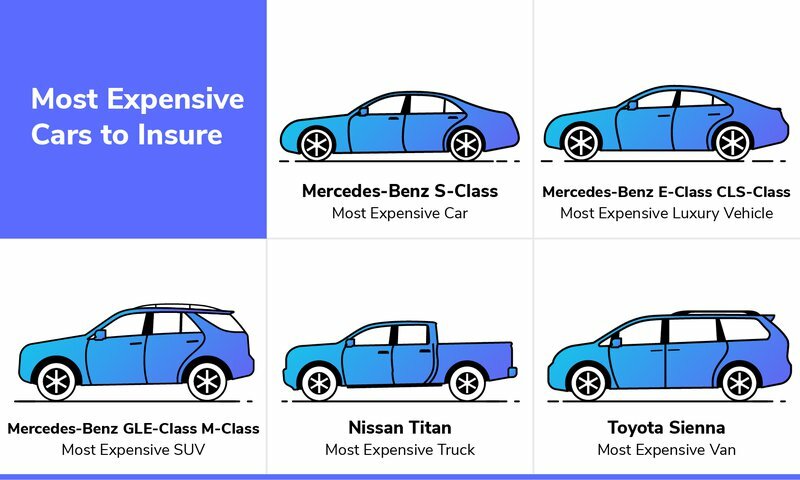 Fairfield wins the award for most expensive car insurance in Alabama with an annual premium of $1,579 compared to the state average of $1,358. Close behind are Dolomite and Mulga, each with higher premiums than the larger Birmingham. 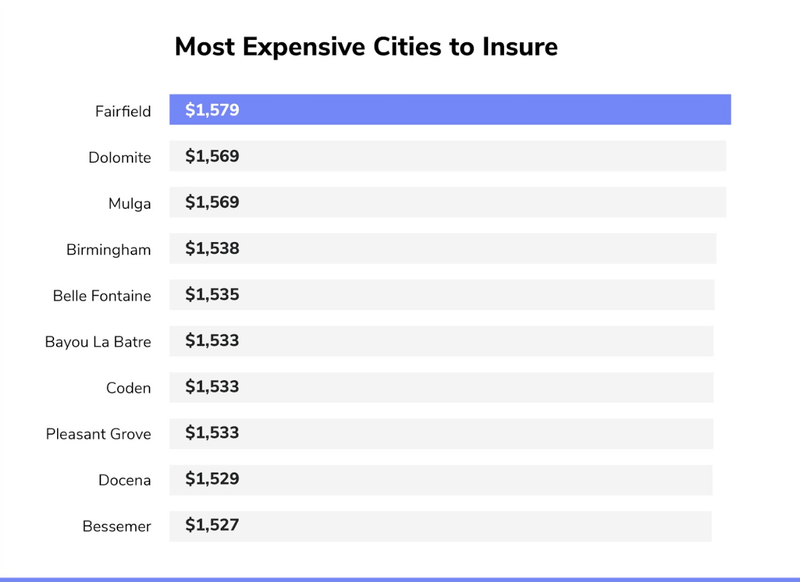 The top 10 most expensive Alabama cities for car insurance have annual premiums of at least $200 more than the state average. Alabama’s capital, Montgomery, doesn’t even make the list. Check out the graph above to see which cities topped the list. Using a vehicle for business will cost you the most with insurance providers at an average annual price of about $1,430. The cheapest use for your vehicle is on a farm, with an annual average of $1,265, but you must be able to legally define yourself as a farmer before you can register your vehicle as a farm vehicle. Using your vehicle for pleasure or a 15-mile work commute will cost you relatively the same — about $1,347 per year. If your commute is longer than 15 miles, your rates will jump to an average of $1,358. These numbers show you only pay slightly more, about $11 more per year, for a longer commute. Alabama requires liability coverage, at a minimum. Liability insurance covers injury costs and lost wages that you cause to another driver, their vehicle, or any of their passengers. Liability coverage will not cover bodily injury to yourself or the cost of your own property damage in the event you are at fault in an accident. The liability coverage limit in Alabama is $25,000 for bodily injury per person, $50,000 bodily injury coverage per accident and $25,000 property damage per accident. These rates mean if the costs are greater than the numbers listed, you will be required to pay the difference out of pocket. Liability coverage is the state minimum, but you have the opportunity to purchase a more comprehensive policy through most companies. If you are a teen or parent of a teen looking to get car insurance, you’re going to pay over $7,000 annually if you live in Mulga, Dolomite, or Fairfield. For more information on teen driver rates, check out our cheap car insurance for teens guide. Finding car cheap car insurance in Alabama that fits your needs can be easy! Before making your final decision on your insurance provider, consider your vehicle use and what you’re looking for in a provider. Many car insurance companies offer discounts for eco-friendly vehicles, safe drivers, shared family policies, and more. Look into services like roadside assistance and accident forgiveness, as these can save you time and money in the long run. What's the cheapest car insurance in Alabama? Drivers with good driving records typically enjoy lower car insurance costs than drivers with histories of speeding tickets, at-fault accidents, or DUI citations. Alabama drivers without a recent at-fault accident save 31% on their car insurance, on average, while Alabama drivers without a recent ticket save 16%. Both of these figures are near US averages. In addition to earning a cheaper premium for driving incident-free, you may qualify for a safe-driving bonus through your car insurance company. The amount of these discounts may vary, but they typically run between 5 and 10%. Young drivers (those between the ages of 16 and 25) pay extraordinarily high auto insurance rates, with those aged 16-19 paying the most expensive premiums of all. Because of the risk presented by inexperienced drivers, teens pay more than three times the national average for car insurance. In Alabama, the typical teen driver pays $5,573 per year — approximately $600 more than the nationwide teen driver average and more than three times as much as a typical driver in Alabama. If you have a clean driving record — no at-fault accidents, speeding tickets, DUIs, or other recent citations — you'll probably pay less for car insurance. Conversely, a bad driving record will cause your rates to skyrocket: car insurance premiums typically increase by 39% after a DUI, 31% after an at-fault accident, and 16% after a speeding ticket in Alabama. These post-incident rate hikes roughly align with national averages. If you have a sparkling clean driving history, be sure to inquire about your insurer's safe driver discount. What are the Best Car Insurance Companies in Alabama? Every auto insurance company emphasizes its low rates. But as with any product, the cheapest option isn't always the best choice. Considering the stakes, it's worth doing your due diligence to find the policy that will cover your car adequately in the event of a collision. When your money is at stake, it's worth being patient and finding a great value, rather than settling for the cheapest car insurance in Alabama. Compare top insurance companies' financial strength and claims satisfaction levels to better understand the level of service they will provide. Claims satisfaction — measured by J.D. Power — is rated on a scale of 2 to 5, with 5 being "among the best" and 2 being "the rest." Financial strength — calculated by A.M. Best and ranging from "Superior" to "Poor" — assesses an insurer's financial strength and ability to meet its policy and contractual obligations. What is the Best Car Insurance Coverage in Alabama? The minimum required insurance level in Alabama is $25,000 Bodily Injury per person, $50,000 Bodily Injury per accident, and $25,000 Property Damage per accident. If you select the minimum required coverage in Alabama, expect to pay an average of $611 per year. This is cheaper than the national average by 7%. If you opt for a higher level of car insurance coverage, you can choose a policy with comprehensive and collision coverage, which will protect against damages caused by car-versus-car collisions, theft, or weather incidents. Better coverage comes at a cost: in Alabama, a comprehensive policy with a $1,000 deductible costs $1,219, 100% more than basic liability-only coverage. For a comprehensive policy with a $500 deductible, expect to pay 123% more than you would for basic liability-only coverage. Compare average rates for liability-only and comprehensive coverage levels below. These numbers reflect the minimum limits required in Alabama but higher coverage amounts are available with most companies. Do you need insurance to drive in Alabama? If a vehicle is driven regularly, it needs to be insured — period. If you're the owner of the vehicle and primary user, you can insure the vehicle with any insurance company in Alabama. If you regularly borrow another driver's vehicle, you can be added to the insurance policy. Is Alabama a no-fault state for car insurance? No. Alabama is a tort state, meaning you are responsible for any property damage and bodily injury you cause. Who needs to be listed on car insurance in Alabama? This varies depending on your insurance company. Most insurers require anyone who uses the vehicle more than 12 times during a policy period — typically six months — to be listed as a covered driver. Moreover, non-driving residents can also be required to be listed on the policy. If they do drive, they can be listed as an excluded driver, meaning they are listed on the policy but not included in the premium calculation. 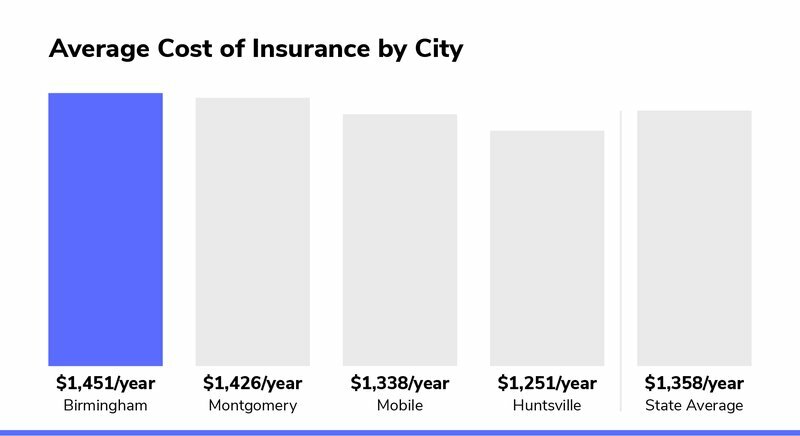 How much does car insurance cost in Alabama cities? Car insurance companies calculate your rate based on many factors, location of the vehicle being an important one. 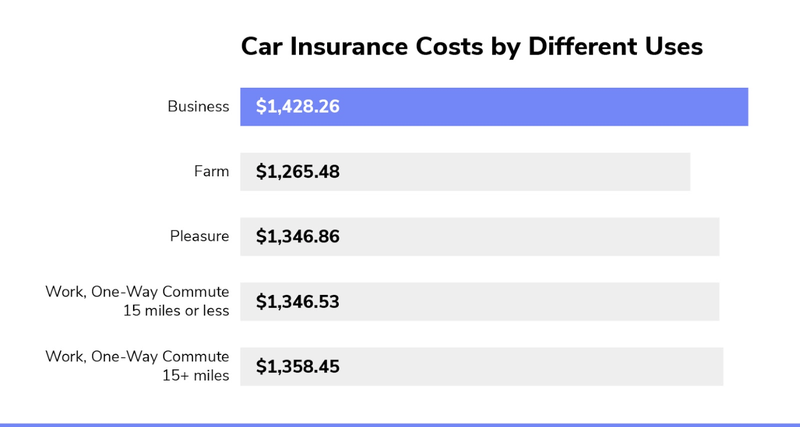 The cheapest car insurance is found in Enterprise, Alabama, and the most expensive in Birmingham, Alabama. Does liability cover my damages caused by a windstorm? In Alabama, does the car insurance follow the driver or the car? If you’re caught under the influence of alcohol or drugs while driving in Alabama, you’re subject to a slew of penalties. Though repeat offenders are subject to the harshest penalties, even first-time offenders will find DUIs costly, both in the cost of fines and time spent in jail. Alabama is considered an “at-fault” state. This means that, in the case of an accident, fault can be assigned to a driver and they will be held liable for the cost of damage, injury, and other loss. Accidents must be reported to the Alabama Department of Public Safety within 30 days of taking place if the accident resulted in injury, death, or damages exceeding $250. Or attempt to make a speed record on any public highway. You are guilty of distracted driving in Alabama if you are operating a wireless device, such as a phone, while actively driving on the road. This includes using a device to send or read texts or emails, watch videos, or otherwise operate the device. You are, however, allowed to use the voice-activated features of your device while driving in Alabama. Since Alabama does not have a hands-free law, you are allowed to hold your device while driving. You are also allowed to select a contact to call, but cannot send or read any communication with any contacts. You are also allowed to use the GPS or navigational functionality of your device while driving, provided that your destination is pre-programmed before driving. Any mobile device use is prohibited for drivers who are 16 years old. In addition, 17-year-olds cannot use a phone while driving if they have had their license for less than six months. In other words, driving dangerously in Alabama may result in you being charged with reckless driving. At The Zebra, we know better than most just what a pain buying car insurance can be. We also know that students suffer from higher-than-average policy rates. Talk about a double-whammy. That’s why we’ve decided to continue The Zebra’s annual scholarship with the goal of helping to alleviate the financial pressures of college-bound students in Alabama, while also getting an insider view of the Yellowhammer State.